My penchant for Honda began in my youth as the proud owner of a Honda Odyssey Dune buggy. I loved that rig, filling many a weekend with high-speed fun, hooning around the property. Now it’s generational as my young son happily thrashes his Honda Civic paddock bomb around the property. Honda has always served me well; it is my brand of choice. A rather biased way to start a review, but that’s my experience. I have a number of Honda built and Honda powered machines in my shed and have always found Honda equipment reliable, well designed and rugged. 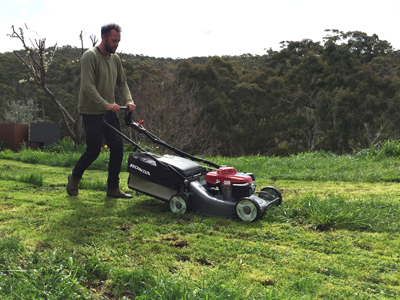 In early September the HRU216M2 Honda Buffalo Classic self-propelled mower was delivered to my door. To test the mower I just needed a couple of nice days so the grass could be dry and ripe for mowing so that I could shine the best light possible on my favorite brand. Skip a few weeks of time, it was mid September and deadline had passed. There had been nothing but rain at every available test moment and I was out of time. Regardless of overly long wet spring grass the show goes on, and during a break in the clouds I gave the Honda a go. Spec wise the mower is at the top of its field. It boasts a tough 21” cast alloy deck and 70 litre catcher bag which is easy to attach with well designed hand hold points for easy grass unloading. It also comes with a nifty mulching plug, which fits into the chute to allow for catcher free mowing. The Buffalo Classic boasts a hefty 4-stroke 5.5hp GXV160 engine with a cast iron bore, snorkel and easy start one pull system. The HRU216M2 uses Honda’s shaft drive system with a 3-speed gear box, and after quizzing the blokes at Bolton Motorcycles (my local outdoor power equipment shop) they attested to the drive system’s incredible reliability. The throttle and choke control is a chunky standard layout handle mounted unit. Pushed to choke the mower really did start first pull from the handle-mounted cord. I’m not big on reading the manual, so it took me a minute to figure the blade start and drive controls. There are two push bars mounted on the handle to engage these functions. The one closest to the handle bar is the blade control; push the yellow button in first then the push bar forward and the blades start up. Nifty! Let go and the blades instantly stop; using Honda’s blade brake technology making this unit safe, with the bonus of no more throwing up dust and stones when crossing paths. Push in the second push bar and away you go. I found speed two the best pace for me, and thoroughly enjoyed the mower doing the hard work for me. For my test the Honda Buffalo Classic had the worst conditions: my grass was very long at about 200mm, spring lush and wet, filling the catch bag every 20 meters or so. The Honda did its job very well in conditions that would stall other mowers dead, especially at the low height I had the machine set. It had power to boot and cut cleanly. The Honda HRU216M2 is a tough, well-designed unit with fantastic safety features. It is well suited for people with large blocks and would easily stand up to the rigors of contractor use. My bias toward Honda has not changed. Jason Waterhouse is renowned for his sculpture, but also creates interiors, furniture and fabrication work for artists. Jason is the director of artist and makers’ space Stockroom and men’s ware store NOTOWN Outfitters in Kyneton, Victoria.